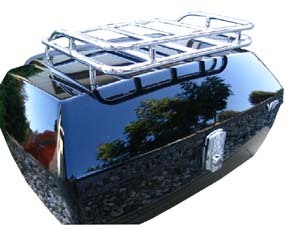 Aftermarket Touring Trunks: An economical aftermarket trunk alternative to upgrade your Electra Glide Standard, Road Glide or Road King for more trunk storage capacity. 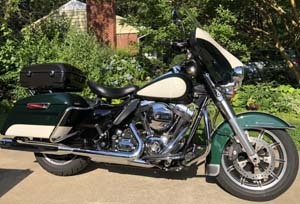 These Touring Trunks can be attached using the H-D or our standard accessory Two-up or Tour-pak rack or to our detachable TT-RACK or TT-2RACK or many of our racks located on our Relocator Rack/Detachable Racks page. Easy installation. 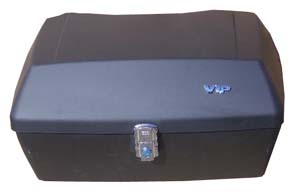 Touring trunks are custom and special order items. 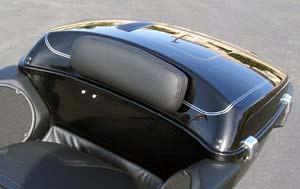 Accessories: Wrap-around vinyl backrest for the above touring trunks in black also available. Adds HD styling and comfort for your passenger. Note: Updated version does not have buttons as shown to reflect the updated stock factory styling. Easy installation. 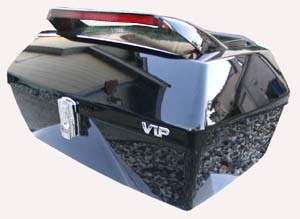 LED Lighted (optional flashing) Rear Spoiler in black is also available in injection molded ABS plastic. Length 16" x Width 5 1/2" x Height 2 1/2". 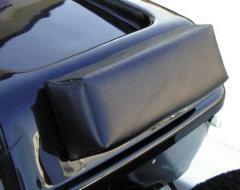 The Spoiler can be wired as a brake light or running light, but not both at the same time. 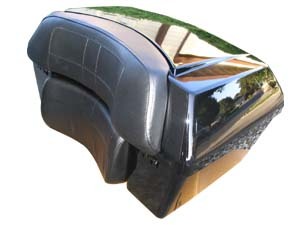 The flashing option is built into the spoiler, your can choose either solid brake lights or flashing brake lights (depends on the wiring). Included mounting hardware and easy installation instructions. 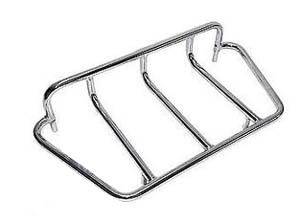 Top Racks in Chrome: Top Rack 1 cannot be used with the TT-BR Wrap Around Backrest. 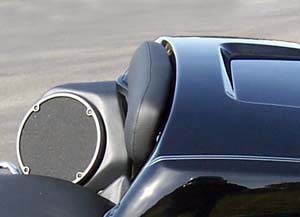 Top Rack 2 can be used with the TT-BR Wrap Around Back Rest. 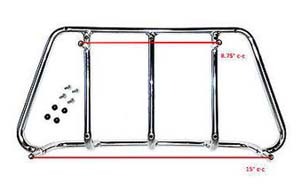 Both rack are chromed tubular design in chrome with mounting hardware. (Dimensions: TT-TR1: Left to right 12-1/2", Front to Rear: 10 3/4", TT-TR2: Left to Right 17", Front to Rear 10") Comes with mounting hardware. TT-LOCK: Replacement lock set for the DMY Trunk. 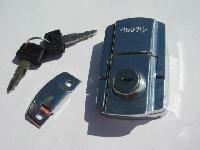 Heavy duty design in chrome finish, comes with two keys. The lock is the "bolt on" item, no special tool needed. 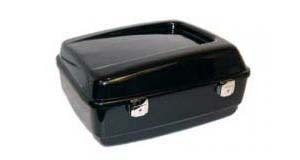 Police Bike Trunks: These ABS plastic trunks will work with your police bike saddlebags. Comes with alluminum base plate. ABS molded plastic in birch white or black. 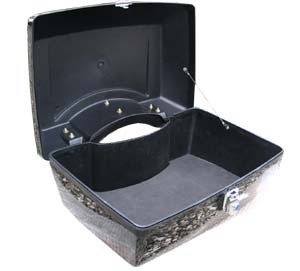 Comes with one Police Trunk, 4 rubber isolation mounts with hardware, two keys and bottom plastic shelf. 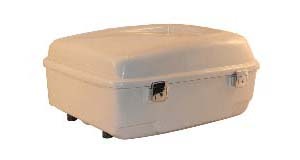 Large Police Bike Trunk sizing: OEM specified. 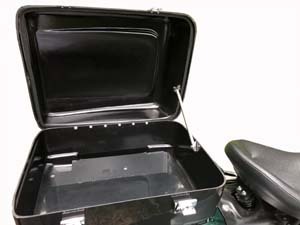 Small Police Bike Trunk sizing: Approx. 20-1/2” L x 16-1/8” W x 9-1/2” H. Default selection: model year '09 to current. 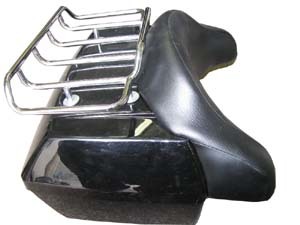 TT-TR3: Top rack 3 can be used with or without the wrap around backrest. Size: Left to Right 18'', Front to Rear 9''. This top rack is built by light weight steel tubing in chrome finish.Mounting hardware is included. 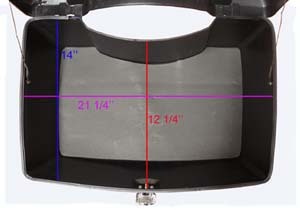 Mounting points shown on our image. Instructions & template are not available for this item. Our TT-1B trunk sold separately. TPBP-01: The most slim line and lightest pad in the industry! This Slim-Ergo tour-pak Backrest Pad replaced your Ultra's Standard Backrest when you do not expect to be carrying a passenger on tour. 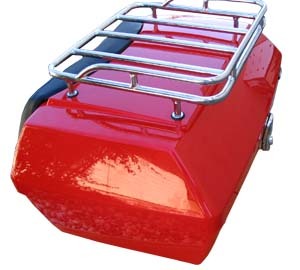 The weight of the standard passenger backrest increases the tour-pak lid weight by ~5 lbs. 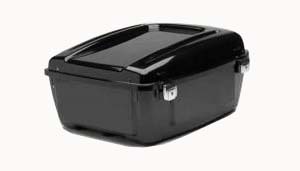 Replacing it with the TPBP-01 improves the ergonomics when opening/closing you tour-pak lid by substantially lightening the weight. 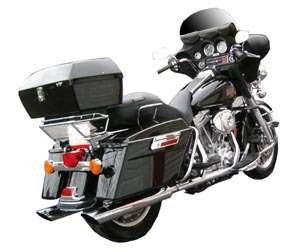 Adds a nice stream-lined, low profile "chopped tour-pak" look to the rear of your bike. Weighs only ~6 ounces and works using your stock tether or our TB-3 tour-pak Ultra Brace. 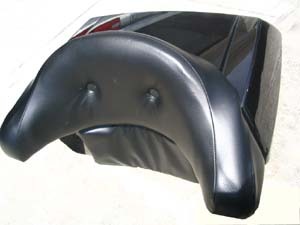 Comes with hole plugs to cover the stock passenger backrest mounting holes. Fits model year 2014+ Ultra Classics. Easy installation! Custom made to order part; special order. 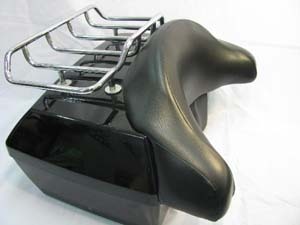 PT_BR: Back Rest is made from high density foam and heavy duty naugahyde for the above Police Bike Trunks. 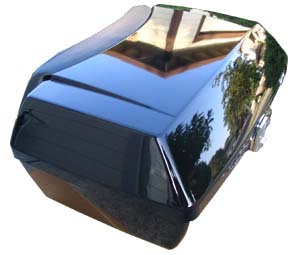 PT-MY: A chrome tubular mounting yoke designed to mount the Small Police Trunks behind your HD Police Bike solo seat up to model year '08. PT-125: Rubber 1" anti vibration shock mounts w/female ends for police trunks that go between the trunk and the mounting plate.